An inspiring step-by-step guide to creating contemporary textile artworks themed on nature. Stitched Textiles: Nature is the fourth title in this successful theme-based series. It contains an extensive section on techniques, featuring step-by-step guides to machine- and hand-stitching, attaching embellishments and found objects to your work; painting and printing on fabrics including cotton, silk and Khadi paper; and using objects found in nature, such as leaves, to make unique and iconic prints. The book includes three beautiful, inspirational projects based on different facets of the natural world: Ocean, Rainforest, Botany, Birds and Animals. 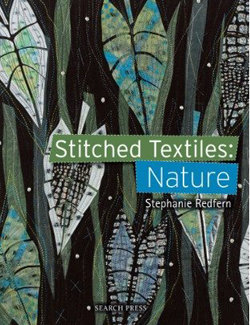 Stitched Textiles: Nature also features examples of the author, Stephanie Redfern's own intricate and detailed works based on nature, exploring the means by which the pieces have been created, and the wonderful stories behind Stephanie's journey as an artist. The wealth of information and visual stimuli in Stitched Textiles: Nature is intended to inspire the reader to create their own works inspired by nature. Stephanie begins by exploring the use of sketchbooks and study pages; progressing to picking out iconic elements from sketches and photographs; and eventually assembling a stunning, personal piece of stitched textile work on fabric or on cotton-blend Khadi paper; applying handstitch in metallic threads; machine stitch in whimsical and beautiful patterns; embellishing with natural beads or found objects.